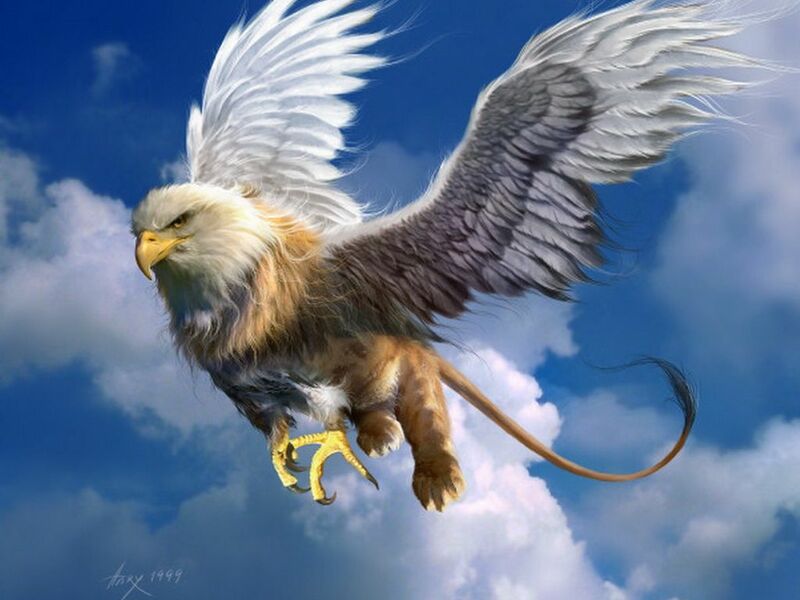 After the dragon, the griffon is probably the most iconic of all fantasy monsters. 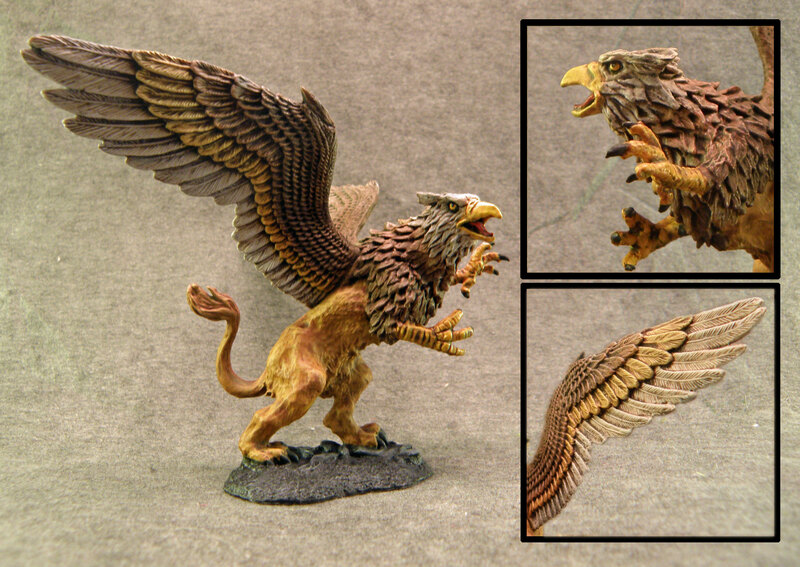 Half eagle, half lion, and all predator, this creature is the subject of today’s painting session. This week we have 8 painters, and 3 projects to share with you. All Things Horror – Zombie miniatures anyone? 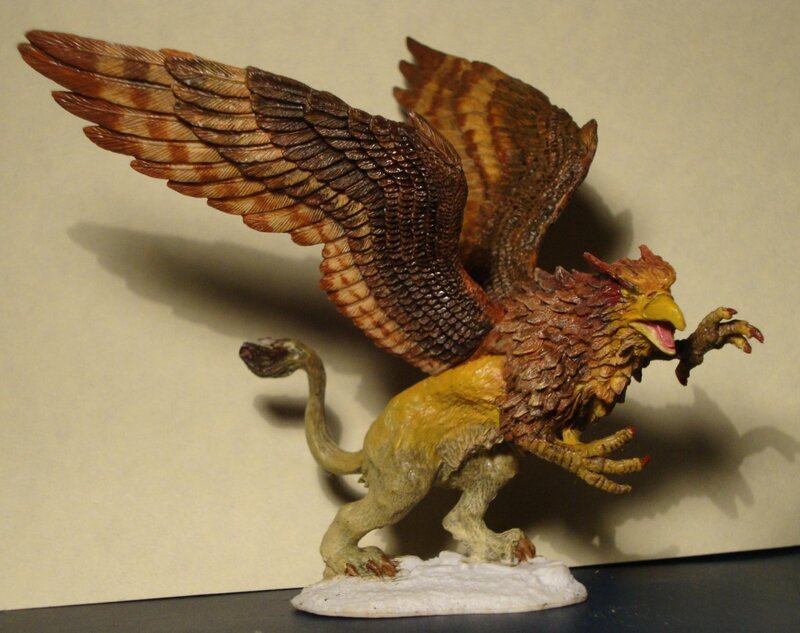 Fantasy Worlds – This one is a pretty eclectic mix of minis. Swedish Army – The Swede’s are coming! A model this large presented some interesting challenges, mostly in time commitment and picture quality. I lack a setup that can properly light and frame such a large mini. A proper light box is definitely on my to do list; a couple of the emails sent to me echoed a similar sentiment. Despite the challenges, I really enjoyed this mini. 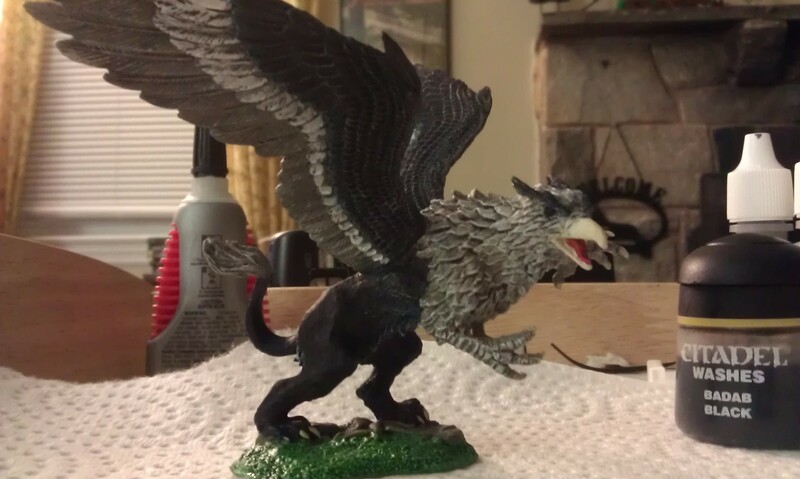 The detail in the wings was excellent, and really fun to paint. Photo issues aside, I’m really happy with how this one came out. Jessica has color variation that is both wonderful and subtle. David went with the darkest of all the color schemes this week. 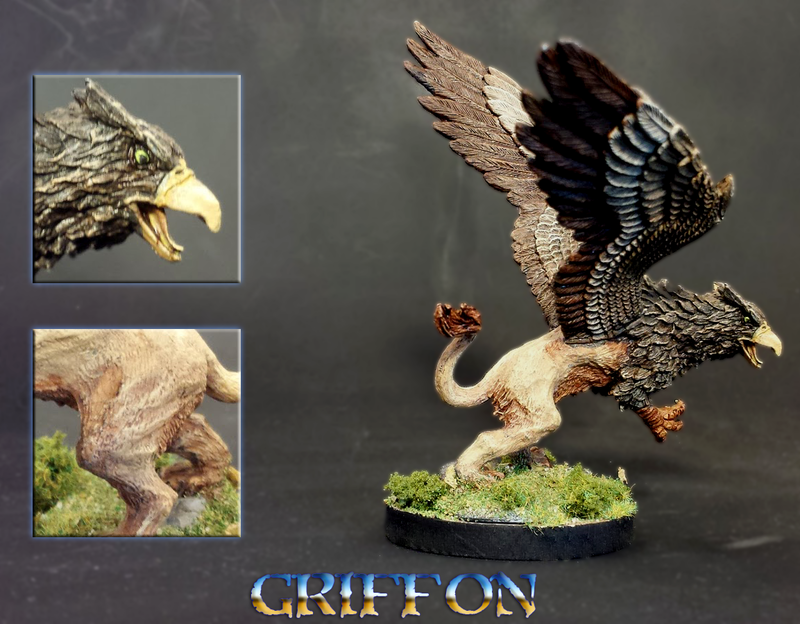 Clint’s lion half is my favorite on all the minis, I also think it looks the most likely to eat me. Arjen’s wings came out AMAZING. I love the striations and the details. Danniel chose a unique and authentic color scheme, complete with photo references. I thought it came out really nicely. Laura went with a beautiful winter color scheme. She was one of the only painters not to go with a traditional brown color scheme. 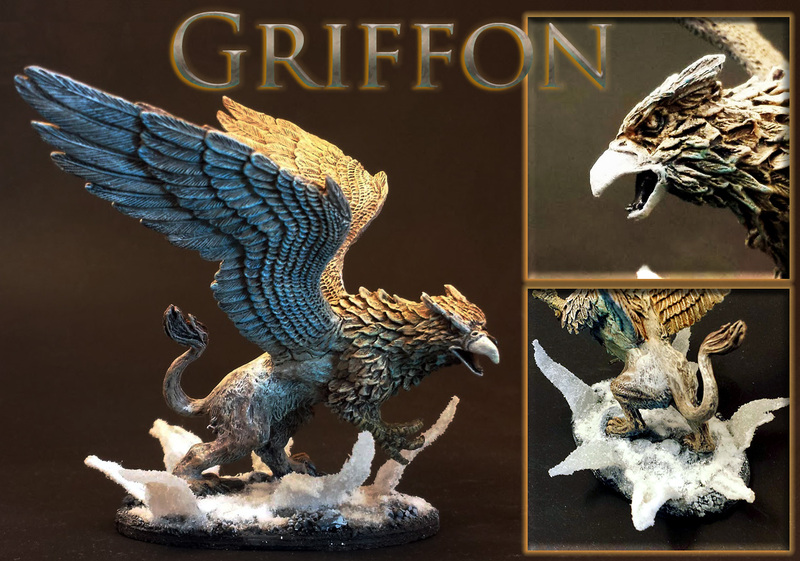 Tonya got her Griffon in just as I was going to bed. Her feather details are equally outstanding; I think this one is my favorite for the week. She said she could have used more time, but I don’t see where it would be needed personally. Wow–you guys did some awesome ones this week. 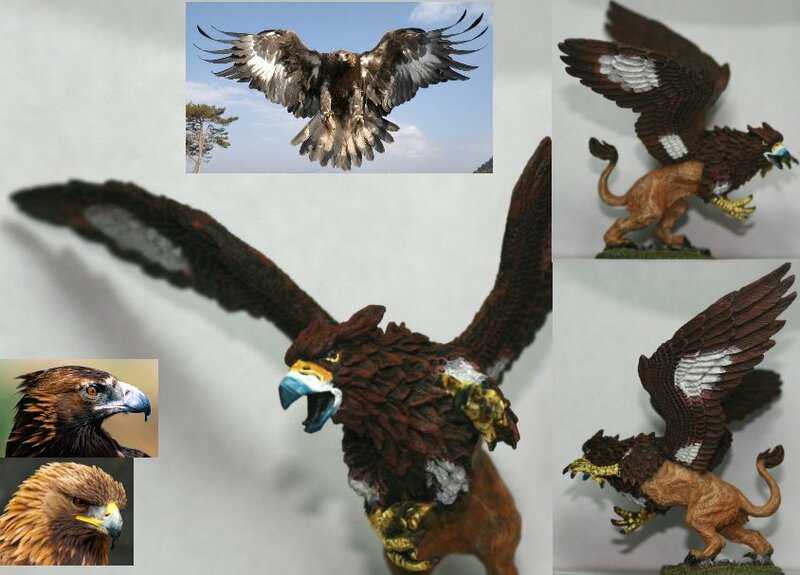 Clint really brought out the lion, but Arjen’s color scheme was definitely the coolest, to me. Wow! Everyone did a very nice job. I’m looking forward to the day when I have the nerve to give mine a try! I just found this blog and am interested in participating. When do I need to get you a picture of the next mini by? Great paint jobs here! I particularly like Laura and Tonya’s color schemes. So pretty…..
Hi Kristy. Ideally, pics are in before 9PM Mountain Time on Sunday! That’s when David finalizes the Monday morning post. Am I the only one that finds larger minis quicker and easier to paint? Yes, and no. Basecoating is SO much faster for me, but detail work is detail work no matter how you look at it – and I’m a stickler for details! I’d liked to have done a little more shading and highlighting on his claws and work on his base a bit more before I truly felt done with this one, but he’s game-table ready at this point, so I’ll probably just call him finished and move on!